The Zortrax Apoller is a Smart Vapor Smoothing device that uses solvents to smooth the surface of 3D-printed objects. The resulting products look like they are injection molded and all of the little lines associated with FDM printing will disappear. Given the often flimsy structural quality of FDM prints, this smoothing is more cosmetic and allows you, in theory, to create molds from 3D printed parts. 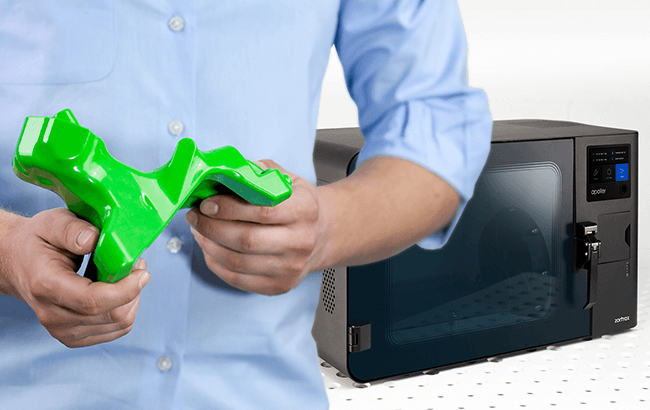 In reality these glossy, acetone smoothed parts just look better and give you a better idea what the finished product — injection-molded or milled — will look like when all is said and done.